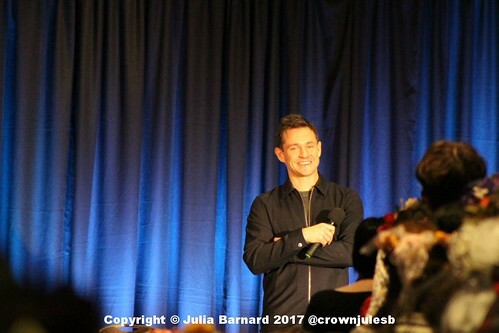 The first year was “Red Dragon“, the second was “Behold the Red Dragon“, and this third convention was “Red Dragon 3” – on all social media it’s #HannibalCon. For other random pics from the con, see my Instagram feed (and search all sites using the #tag). 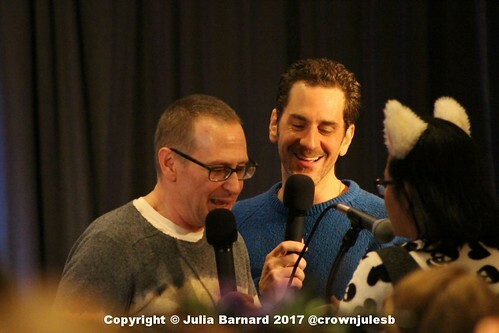 The guests this year were phenomenal (they are always great, of course! 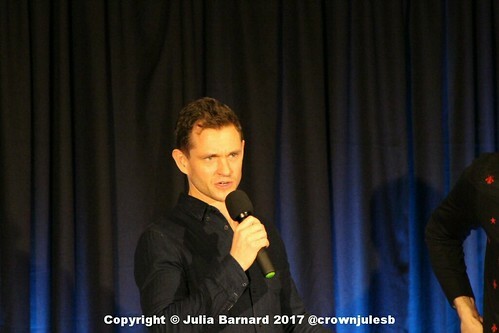 ), we were graced with the presence of Will Graham himself, Hugh Dancy; Writer, Creator, (and Our Lord and Master!) 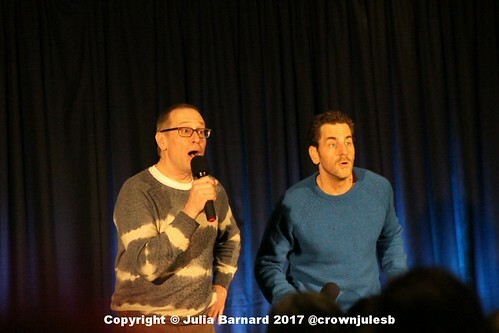 Bryan Fuller; Demore Barnes (Tobias Budge); the amazing comedy duo that is Aaron Abrams (Brian Zeller) and Scott Thompson (Jimmy Price); and the very sweet Ellen Muth (Georgia Madchen). 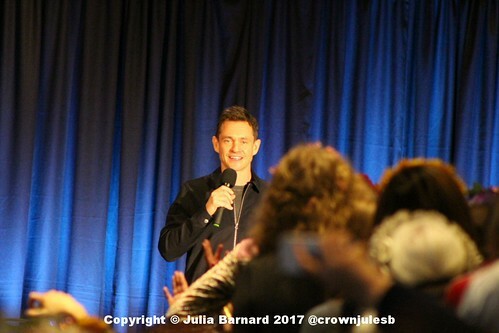 Our new home for these events is the Radisson Edwardian Hotel in Heathrow, their conference rooms become the guest halls for Q&A sessions, parties, and the autograph and photograph sessions with the guests. 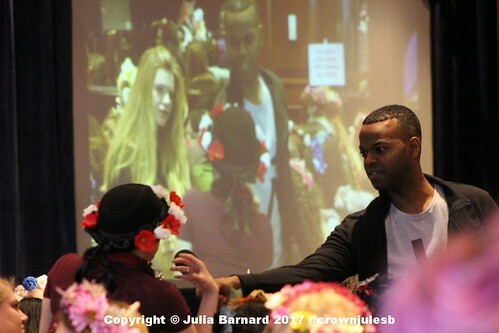 It’s a weekend of standing in lines and swapping homemade gifts with other fans (something no other fandom does.. we Fannibals are a unique and creative bunch!). I took a batch of my Visitor Badges from the Baltimore State Hospital for the Criminally Insane, and I loved giving them away to random people.. gives me an excuse to start a conversation anyway! Although it says not to give the guests gifts during the signings, they still end up with a pile of stuff next to them! 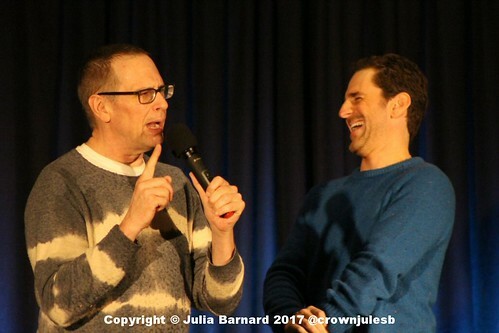 So I couldn’t resist offering Bryan one of my IDs.. and he grabbed it with such glee, and put it on his collar… and it was still on his person when he came on stage (finally… he’s a slow signer!). It made me so happy to be appreciated for my silly bits of art. Photos, signatures and Bryan drew me a clock in the Hannibal Cookbook! Those are REAL Roe Deer antlers! This flower crown took me ages to make, and I’m quite proud of it! Photo ops with Demore Barnes in my “Sassy Science” Cosplay, and with Bryan & Hugh in my Ravenstag Cosplay. A recreation of the human cello! Hugh & Bryan mid-conversation, but LOOK, Bryan is wearing the BSHCI Visitor badge made by ME! *squee*! 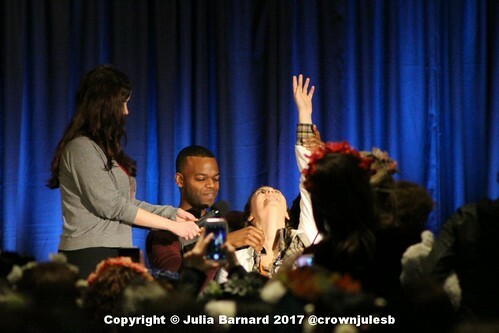 Demore asking the Fannibals what this show and the Fandom means to them. So many feels! …and then they have to investigate! Aaron is all of us, when these guys are talking! 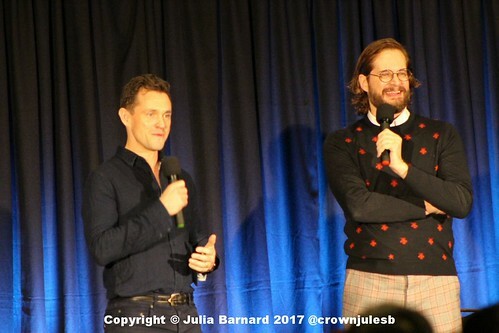 Hugh Dancy & Bryan Fuller. Look at those cuties! 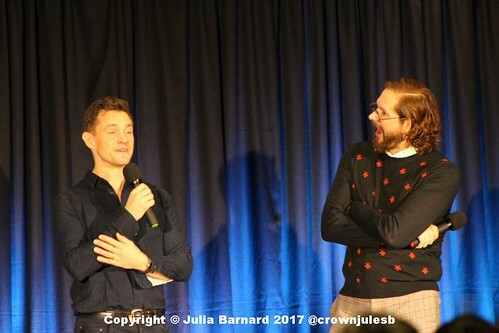 I don’t remember what Hugh said, but Bryan is clearly amused..
…and then it all goes to pot! 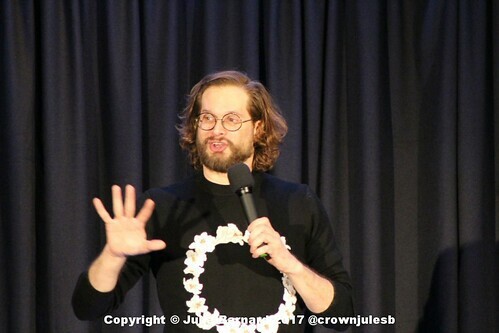 Towards the end of Demore’s second Q&A session, he asked the Fannibals why we are all so fervent in our devotion to this particular show. 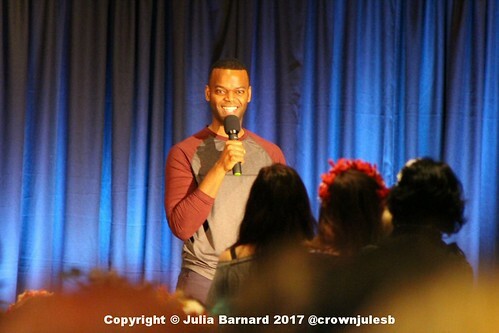 He went around the room and a few people spoke up about what Hannibal means to them. The general consensus was (with my own opinion added here) that Hannibal is basically a show about two loner characters, they’re the odd ones out, they don’t fit into “regular” society, one is a criminal (but that’s incidental) he’s on his own and although has particular “tastes”(!) he is basically looking for a human connection. The other character has social anxiety and is slightly on the autism/aspergers’ spectrum. Both are incredibly smart, and yet have difficulty integrating. But they find each other, and they understand each other, and they accept each other (for all their many faults!). Ultimately, it’s a story about survival and friendship, against all the odds. THAT is something that resonates with a lot of us. I can definitely say for myself, that I have trouble sometimes making those connections with people. Yet this show has given me hope that there are others out there who can understand where I’m coming from. And now, that’s what I live for. 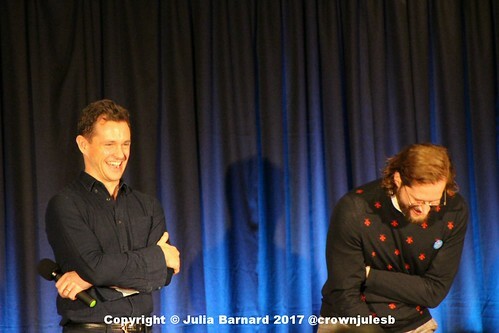 Our Fannibal Family! 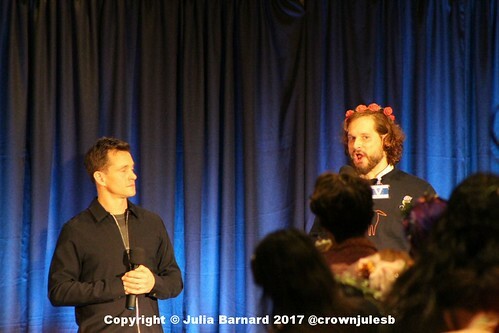 Fannibals are totally inclusive. I have found us to be a safe and supportive group comprising every type of person. Together, we make sense. And as an additional bonus, I’ve re-connected with an old school friend, who I hadn’t seen for years, and now we’re really close again. How lovely is that?! Some of the beautiful artwork from the Hannibal Musical Programme. One of the absolute highlights of the weekend, was the performance by a group of Fannibals of “Hannibal a Fannibal Musical”. A parody/homage of all three seasons of Hannibal. It was an absolute triumph of a show, brilliantly funny, and very cleverly put together. AND performed by a group of people who had only fully met that day! Well done indeed. AND all of the celebrity guests came in to watch it too, and they showed their appreciation with huge laughs, applause, and running up to them after the show to congratulate them all. Bravo! Find out more about the musical by following them on twitter @FannibalMusical. Red Dragon 4 will take place on 23rd to 25th February 2018 at the Radisson Edwardian Hotel, Heathrow. 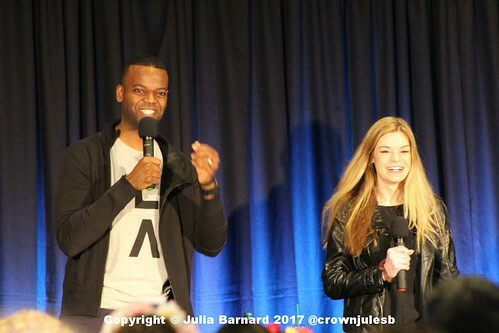 Grab a ticket while you can from Starfury Conventions.